Adventure Time is going to get mathematical in the gaming world again this Fall, and this time it'll be called Adventure Time: Explore the Dungeon Because I DON'T KNOW! ; once again it'll be one of the coolest game names to be found. Just last November North American gamers could enjoy Adventure Time: Hey Ice King! Why'd You Steal Our Garbage?! on 3DS and DS, but this new title's keeping up with the times, arriving on both Wii U and 3DS (as well as Xbox 360, PS3 and PC). Announced by D3Publisher and Cartoon Network via a press release, it's confirmed that WayForward Technologies will once again be picking up development duties while working with show creator Pendleton Ward. It's described as an action game that'll include four player co-op. In a completely new storyline and adventure and featuring the voices of the show’s most popular characters, fans will have to save the Candy Kingdom by exploring the mysteries surrounding a massive Secret Royal Dungeon deep below the Land of Ooo. Select from an assortment of fan-favorite characters from the show, including Finn, Jake, Marceline, Cinnamon Bun, and more, and team up with your friends in four-player co-operative multiplayer as the Adventure Time world comes to life. There are few details beyond that, while it's unclear whether the 3DS title will be similar to the home console equivalents, or if it'll have its own style. We quite liked the first game in our Adventure Time: Hey Ice King! Why'd You Steal Our Garbage?! DS review, and we have no doubt fans of the series will be keen to try this one out; Europeans will be hoping that this new entry will do what the original couldn't and make it outside of North America. Not much info yet, but it's a new Adventure Time game this year. Surely that's enough? If it has the ALTtP gameplay the other one had i might consider it. Multiplayer? I adored the first game so I'm in. I'm a huge fan of Adventure Time. Playing this on the game pad with the Miiverse functionality will definitely bring about some interesting pics and post. We have to make this game sell real good so that our European brethren will get it! @Xilef it was nothing like alttp it was lozla. I wasn't too impressed with the demo for Adventure Time: Hey Ice King so I didn't buy it. However, Adventure Time: Explore the Dungeon sounds like a new direction with the Adventure Time games that I actually might be interested in. When I heard "a four-player cooperative game", I imagined a Mario/Rayman styled platformer set in the world of Adventure Time. 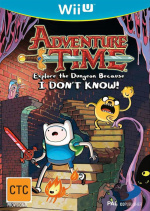 I'll definitely give the demo a go and if I like it, I'll definitely buy Adventure Time: Explore the Dungeon for a fun solo and cooperative plaftorming experience. Not bad but the 1st one never came to europe. Joking. I kind of enjoyed Hey Ice King! Why'd you steal our garbage?! !, though if Explore the Dungeon Because I DON'T KNOW! turns out good, I might consider buying it. I hope it's longer, I loved the 3DS one but it was short! Its 3am and im typing gibberish acronyms for absurd titles, time for the sleeps. @ClassicSonicFan When I read four player co-op, I immediately thought of Four Swords! Recently got into watching Adventure Time, and I must say I adore it. I'm still a little sceptical when it comes to video-game spin-offs of TV series though, so I'll have to wait for a little bit more information on this one. I wanted to purchase the first game, but after review stated that it was a bit on the short side I opted not to. Though I may still end up getting now that it has dropped in price considerably since then. Here's hoping this game has a bit more content to justify a day one purchase! @Dpishere I'm in the same boat as you. If the price is right then I might consider getting this game. Well, this was unexpected. I still haven't even played the first game even though I bought it months ago. It looks like I'll have some catching up to do. Picked it up for similar reasons and indeed, it wasn't fun at all! I didn't enjoy the Hey Ice King! demo very much, though it had charm and as long as the game takes a better direction this time, I think WayForward can make something really good out of it. Will definitely be keeping my eye on this. If it's on Wii U I think it should be a 3D platformer. Awesome! I really enjoyed the last game, and I'll be picking this one up for sure! I liked the last game. It was short and sweet. I'm currently playing the Hard Mode. Sweet! While the 1st one got kinda stale towards the end, it was hilarious and fun for however long it lasted. Maybe more LSP in this game, pls? Wanted to enjoy the first one so much but there wasn't really a game there. WHole thing was like 5 hours and most of that was backtracking to fetch items. No difficulty at all, just shoved out the door. Somehow, I feel like they are going to start making a Adventure Time game every year. Hope this turns out well like its predecessor. I'm cool with this. I really liked the first one, even though it was short. Nope. Don't like Adventure Time, didn't get the last one, and certainly won't get this one. I loved the 1st game, there were several flaws though so I hope they can patch some of them up. Wouldn't mind returning to the Zelda ll style of gameplay either. It appears not a lot of people here really enjoyed the first game, which kinda bums me out. I loved the game even though it was pretty short and easy. I can only imagine the gameplay to be more frantic and difficult this time around though since they are actually putting in a co-op mode. Hopefully it turns out to be just as fun, but intense like with the New Super Mario Bros. and Rayman games. I hope they put in more content and more of a challenge and deeper combat/levelling system this time. @Bobhobob only if LSP is isn't so annoying. LSP is the only AT character I cant stand, and the LSP centric eps I wanna switch off. well thats great, i'd love to see another ADV Time game, but the first one felt like it was really phoned in and practically unfinished. it didnt take long at all to clear the game and it just didnt have any depth at all. it was fun to play for a bit but i dont know that i would go back and play it again at all. at least i got some cool swag since i actually bothered to pre-order the game. but other than that, it hardly felt like it was worth $40. it seemed alot more like an eShop game that would cost only a few dollars. at least the show is still awesome... and it wasnt the worst game out there. Oh yeah, you guys at Nintendolife also forgot to mention that there's a Regular Show game coming out in the fall as well. Similar to Adventure Time, Regular Show's creator J.G. Quintel will be working with Wayforward on the game as well. I'm Pretty excited for both games! I just cant figure out how Adventure Time is so popular. I watched a few episodes but I dont know. Now Regular Show I enjoy alot. But any way I more thank likely wont get this game. Let's bring it to Europe this time please! Yeah, Europe please! So painful without it! Sounds like this game will be pretty awesome! Hopefully, It'll be a lot longer than 'Hey, Ice King, Why'd You Steal Our Garbage!?' I'm really intrigued by the multiplayer co-op.